Enduro Madness 8 days enduro tour is pure action madness where the fun does not stop when the days riding ends. Pattaya is a ‘garden of Eden’ of excellent enduro trails. The trails here are so good they are used by FIM Asian Enduro races every year. Each day’s riding consists of challenging real enduro trails varying in length and 95% of the time, you will be on the dirt! After the 8 days, you will feel like you have really accomplished something special! You will have experienced the best trails that the beautiful Eastern Seaboard has to offer and have had a guaranteed amazing time. There will be 4 or 5 days of trail riding depending on how tired you get, with one or two awesome activity filled ‘rest’ days including a luxury yacht charter to deserted white sandy islands, a ‘welcome’ day, and departure day. Sabai Lodge hotel is located just off the beach road right in the heart of the world-class entertainment city of Pattaya, Thailand. Within the large room (the best rooms in the hotel), there is a king sized bed, air-conditioner, satellite TV, fridge, keypad lighting system, phone, Wi-Fi, and swimming pool, which is located right outside the rooms. You can enjoy Sabai Lodge's deluxe large pool room while staying here. Opposite the hotel, there is an excellent traditional Thai massage venue where you will be given Thai oil massage vouchers to soothe away any weary muscles. Every day, wake up in total comfort and enjoy a sumptuous, monstrous buffet breakfast to prepare you for the day's activities. This enduro tour is unique as unlike other companies, Enduro Madness no longer run tours that go from location A to B to C to location D, etc. because there are possibilities that on day 3 or 4 everyone was tired, riding gear was filthy and uncomfortable, and although the riding was great there wasn’t much to do in the evenings. That is why Enduro Madness run tours from the same special Enduro Madness location every day. Enduro Madness believes that this is one of the reasons that makes the tour so special because it allows you to ride some of Thailand's best trails in the daytime and enjoy incredible hospitality in the evenings at the world famous Pattaya City, Thailand! You will also be pleased to know that on each day’s ride, you don’t start at the crack of dawn as Enduro Madness's plentiful experience shows that no one wants to start riding at 07:00. On each day’s ride, the Enduro Madness minibus will pick you up at 09:45. After getting ready, you will hit the trails around 10:30 and finish the day's ride around 17:00. The Thailand enduro champion tour guides will be taking photos for everyone with the Enduro Madness digital camera and all riders will receive a free SD card full of all the pictures taken during the amazing holiday tour. GoPro Hero action video cameras are also available complimentary where Enduro Madness will give you the SD card after each day ride so that you can enjoy the memories of this amazing trails for a lifetime! On day one, Enduro Madness can either pick you up from the airport at the time of your flight arrival or alternatively if you are already here enjoying some pre-tour partying, you can be picked up from your hotel that you are staying at, in Pattaya or Bangkok. Then, Enduro Madness will take you to the Sabai Lodge hotel where you can drop your bags off in your comfortable room. You will then run through some paperwork and Enduro Madness will give you the keys to your complimentary scooter. Here, you can relax by the pool, enjoy a Thai massage or have a little exploring on your scooter around the crazy city. Often, the guys enjoy zipping around in the mad traffic nearly as much as they enjoy the trails. The regular customers like to go to their favorite haunts and do their own thing. However, for the new customers to Pattaya, the guides and Giles are available to give a scooter tour of the city and show you some awesome sights while getting familiar with your new surroundings. At around 18:30, you will head to an excellent traditional Thai and seafood restaurant with authentic Thai dancers and musicians playing in the background. The welcome dinner will be paid by Enduro Madness so feel free to order what you like from the menu. During the dinner, you and Enduro Madness team can discuss the planned riding ahead and Enduro Madness team will answer any questions that you may have while demolishing some brilliant local cuisine and a few beers. After dinner, you can either head into downtown and the team will be happy to show you some recommended venues or you can simply retreat to the hotel for an early night to get ready for the next day's ride. At 09:30, the Enduro Madness minibus will pick you up and take you to Enduro Madness’s base where you can try out the bikes and make any adjustments you might want for a custom fit. The things on the motorcycle that you can adjust to your pleasing include gear lever, foot brake, clutch, front brake, and suspension. Get kitted up and you will hit the trails around 10:30 and return at around 17:00. On the first day, you shall take it fairly easy to get used to your bikes and the tropical environment. Ride through an array of trails that gives you a taste of what's to come. Farmlands, pineapple and coconut plantations, rubber, banana and eucalyptus tree plantations, Chad Nok Dam, rocky pathways, woodlands, streams, and other water obstacles are the all-in-one amazing action packed in an adrenaline-fueled day. Lunch will be served at a quaint Thai outback restaurant situated next to a picturesque fishing pond. After lunch, you will head to a hilltop Buddhist temple, which makes for a great group photo opportunity. Then, you will follow some fantastic sandy trails and dirt roads up to the peaks of some nearby mountainside tracks. On a clear day, the views stretch for endless miles showing all of Pattaya, Jomtien, Bang Saray, and the many islands out at sea in the Pattaya archipelago. You will head off to Khao Mai Kaeo Jungle where there are over 70 kilometers of awesome single track jungle trails. The trails can get very tight in places and can be quite challenging. The shade that the tall trees in the thick jungle give is most welcome. There are plenty of steep narrow trails that offer some stunning views. In the deep jungle, there are plenty of wild animals and cattle that are herded by some local families. You will often come across 50 cows that are roaming freely (usually when you are ascending a steep narrow trail). The trails can get extremely boggy and the riding is always intense. In a rainy season, there are plenty of huge swamps that need to be negotiated and a small refreshing waterfall. There is also an awesome sandy motocross track located in the heart of the Jungle. You will do several laps and if desired, you can work on some skills that you feel you might need to improve. After the track exhausts you, you will be back on yet more beautiful Thai trails and head back to the base for a shower and a few well-deserved beers. Relax, chill out, recuperate, and enjoy some great cuisine and a few beers as you head off on a quality boat trip to the chosen deserted white sand islands. If there are seven or fewer riders, Enduro Madness will take you on a private luxury motor cruiser but if there are 8 or more riders, you will be chartering a luxury 60-feet motor yacht courtesy of Pattaya Yacht Charters Co., Ltd.
You will spend the day visiting white sand beaches and snorkeling in the crystal clear waters with vibrant coral reefs around the deserted far islands of the Pattaya archipelago. You will get a spot of fishing and a tasty Thai lunch aboard the yacht or if you are on the motor cruiser, you will have a fabulous Thai and seafood lunch at a quiet navy beach restaurant. You will also stop off at the Monkey Island and feed the incredible cheeky monkeys that will start swimming to greet you at the first sight. Then, you can turn up the boat's sound system at sunset as you head back to Ocean Marina (Southeast Asia’s largest marina) where the Enduro Madness minibus will be waiting to transfer you back to the hotel. An early night is recommended along with going easy on the alcohol as the fifths days ride is a monster that serves up endless gasoline and adrenaline fused cocktails. So, who ordered a mud on the rocks? Coming right up! Today’s ride is designed for those who eat dynamite for breakfast. Enduro Madness will be separating the men from the boys as you head off to the Nang Yong Ban Chang Mountains. This will definitely be the most challenging day’s ride of the entire holiday of this enduro tour. Luckily, there are several routes through these mountains so Enduro Madness will choose the best route that the group can handle. It is slightly similar to the Khao Mai Kaeo single-track jungle trails except the inclines are steeper, the boulders are bigger, the ruts are deeper, and the views are out of this world. It is a long ride of 45 kilometers to the mountains, 40 kilometers through them and then 45 kilometers back again. The ride to and from the mountain is on different trails which are absolutely awesome in their own right, passing through remote villages in the middle of rubber tree plantations and in the rainy season, there are many creek crossings to negotiate. Often, the guides will be taking some bikes through certain sections that customers might not be able to handle. As ever, Enduro Madness team are happy to help and are always there to assist you. Most riders say that the course provided by Enduro Madness on this day is the most challenging, epic, and amazing full-day dirt bike trail riding they have ever done! Today is a long ride on wide open dirt roads and deep sandy trails to the beautiful Silver Lake Vineyard and the Big Buddha Mountain. You will stop off at the vineyard and enjoy some fresh grapes and juice in the spectacular gardens. You will also briefly stop off for a few quick photos at two serene Thai temples, Wat Yansangwararam and Wat Viharnra Sien that are along the trail route. Lunch is served in a remote outback restaurant with Thai menu overlooking the spectacular Buddha Mountain. After lunch, you will briefly air out your boots and enjoy a relaxing 15-minute elephant trek followed by some crocodile fishing where you feed the crocs with chicken on some string using bamboo wooden rods. You will then ride some challenging technical trails in the valleys heading towards Sattahip before you continue the large loop back to the Enduro Madness base with via wide dirt roads that invite you crack open that throttle. There are two options that you can do on this day, the first one is the Sri Racha enduro adventure. The Sri Racha enduro really has got it all, including deep desert-like sandy roads, thick muddy dirt roads, jungle trails, and plenty of stream crossings. There is a part on the trail where there are seven natural tight valleys in a straight-line one after the other akin to huge natural whoops. Another part of the trail requires you to ride 1 kilometer up a rocky streambed with big boulders in place and limestone sides to continue on route. The Sri Racha ride is technical, challenging and as with all of the rides, comes with loads of fun! The second option is taking part in an ATV tour along with jungle zip lines in the afternoon. If you’re feeling pretty tired from all the riding, then why not enjoy a well-deserved lie-in in the morning. When you wake up, enjoy a late breakfast and a refreshing dip in the pool or perhaps a soothing Thai oil massage. Get ready for a 13:00 minibus pick up to the base where lunch will be provided in the form of a huge beef, chicken or veggie burger, fries, salad, and fresh fruits of the season followed by an afternoon of quad biking and zip lining action adventure. During the ATV tour, you will stop off for about 1 hour and a half at the treetops adventure park with various zip lines, treetop obstacles, rope ladders, and flying skateboards where you will swing from tree to tree Tarzan style in the jungle! As the Enduro Madness holiday tour draws to a close, you will party like there’s no tomorrow. The Enduro Madness Pattaya guides will join the group for a meal and a few beers in the city for a little sightseeing pub-crawl to all of the best party venues and beer bars in town. Alternatively, if you’re not a drinker or not into the nightlife scene and you would prefer something else then Enduro Madness can help you organize something different like the spectacular Alankarn cultural show with elephants on stage and special fire effects or perhaps go to the Pattaya Muay Thai Boxing Stadium or one of many other possibilities. Wake up with a huge feeling of accomplishment that you have completed in the Enduro Madness 8-day tour! Enjoy another huge breakfast as the team drop you off your free complimentary SD card with all of the photos that the guides have taken during the last week. Check out time from the hotel is flexible, however you must be checked out of the room by 12:00. The minibus can take you back to Bangkok’s Suvarnabhumi Airport (BKK) at any time you desire or alternatively the minibus can drop you off at your next hotel if you are extending your holiday further. Enduro Madness Pattaya is proud to offer the expertise of Manoch Abdulkaree, Thailand’s enduro champion of the last twenty years. Manoch has won many Thai and international championships, including the Asian Enduro Championship on several occasions. Manoch’s comprehensive knowledge of the tracks, trails, and terrain here on the eastern seaboard of Thailand is second to none. His relaxed, friendly, and ultra safety conscious approach not only makes him a great trail guide, but also an incredible trainer. Manoch is also an exceptional mechanic. This enduro motorcycle tour will take place around Pattaya, Thailand. Please book your flight to arrive at Suvarnabhumi Airport (BKK). Transfer from and to the airport is included. Enduro Madness will pick you up from the airport. Airport: Suvarnabhumi Airport Airport transfer included: Suvarnabhumi Airport No additional charges. You can request this in the next step. 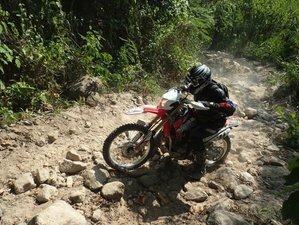 Enduro Madness offers an awesome guided enduro motorcycle tours tailor made for all skill levels from beginner to expert that takes place in Pattaya, Thailand. Please be aware that the tour that starts on the 3rd of every month is for beginner riders and the one that starts on 16th of every month is for experienced and expert riders.